♥ NAPHYRA ♥: My first macarons! 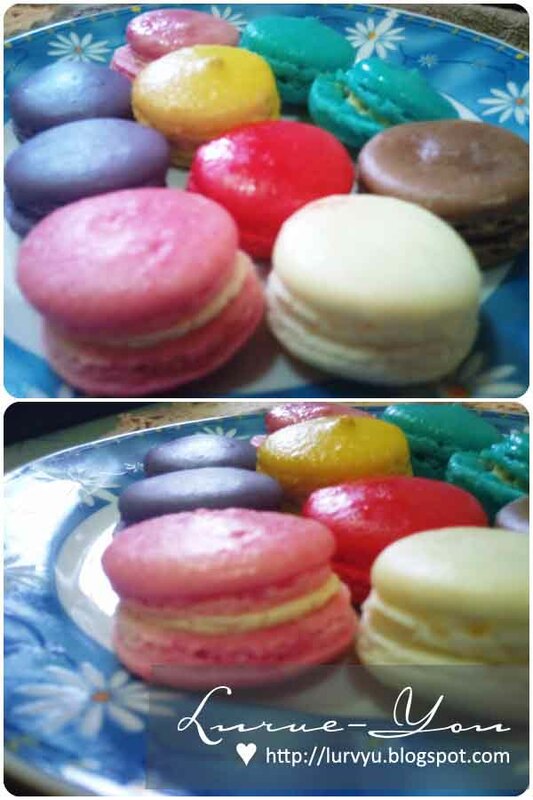 One fine day, when I was rushingly went back home from work..
enche nYomoT suddenly surprised me with these macarons! I was sooo excited! TQ Mr. Husben! You really made my day. It was my first macarons! Macarons have a few flavors but I like strawberry and peanut butter flavor most! It was a bit crunchy but inside was soft. I ate one or two pieces only then it was enough for me because it was too sweet. enche nYomoT bought these macarons at Whisk, Empire Mall Subang. Price? 1 for rm2 and 10 for rm18. serius babe, byk kali i pegi whisk empire subang asek abes je macaron die..huhu..manis sgt eh? sgt manis kann..?? mmg takleh nak mkn byk2..huhu..
nizabeba: yerpp.. kat situ slalu abes. tapi bole order awal2 dr dorang. then dtg amek nnt..
alamak! terlupe nak masukkan pic! haha.. baek sy update pic skrg! Nana: Alaaa.. dah abes laaaa.. hehe!